Moisture: Adaptable to both wet and dry soils, but generally prefers drier conditions. It can tolerate prolonged drought and is resistant to salty sea winds. Propagation: By semi-hard or hard wood stem cuttings. Can be propagated even from tip cuttings or air-layering. Features: A fast growing tall and erect evergreen shrub with leathery and lance-shaped leaves that are rich green in color or variegated in some cultivars. An attractive bush with lovely flower clusters in white, pink, purple or red at tips of new wood. Flowers may be single or double. Be aware that parts of the plant is toxic and latex can irritate skin and cause allergies. 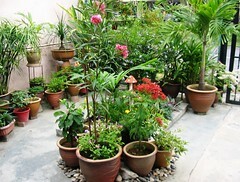 Usage: Great for container gardening and excellent as an attractive accent in any landscape or cityscape. It’s useful for hedges and borders, as well as fabulous to beautify patio, greenhouses or botanical gardens. 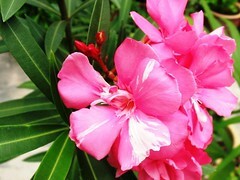 Since oleander are salt and drought tolerant, they can be grown alongside beaches to beautify the scenery. Care: Quite easily maintained with minimal care! All it need is lots of sunshine and sufficient water as required. A monthly fertilizing regime is optional. Oleander shrub should be pruned occasionally to prevent legginess and to maintain a pretty bushy shape with more branches, which will result in more flower clusters. Watch out for caterpillars, white flies and spider mites! To know much more on oleander culture, explore the informative site of International Oleander Society especially for tips on care, pruning and propagation. For temperate regions: Check here! We’ve been longing to add a Nerium Oleander plant to our garden for a very long time, but always hesitated, either because of its toxic nature or the colour and petal formation of the flowers that were available in the nurseries we visited didn’t appeal to us or some other trivial reasons such as its tendency to become leggy! However, in early September we visited a garden nursery, intending to buy some flowering plants to add variety and colour to our garden (perhaps to attract some butterflies too! ;)) and returned with some marigolds and this healthy-looking oleander plant. It seems to be begging us to adopt it and we did just that though it was leggy in its 3 feet tall frame then! Anyway, when we were informed that it has pink flowers, it became more appealing as pink is definitely rare in our garden. 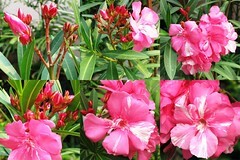 Amazingly, in less than three weeks this same oleander plant sprouted three small bunches of attractive buds and subsequently made ‘headlines’ with its stunning blooms of deep pink and lovely streaks of white in its throat and on the petals! :) Lovely, we just adore it and so also the caterpillar! We found a fat one, measuring the length of our index finger feasting on the young shoots at night, a week ago. Eeek…then John did the usual manly stuff that his scaredy-cat other half wouldn’t dare do – remove it with his hands and snuffed it! Update: March 28, 2007 – Read about how toxic this beautiful Nerium Oleander is! Double-headed – a beauty and a beast! Update: February 18, 2009 – Seems that Nerium Oleander has met its match, the Daphnis nerii (Oleander Hawk-moth), a beauty whose ‘beastly’ caterpillars can devour a whole Oleander shrub of young leaves and flowers in a short time.